Availability will be determined on a first come/first served basis. Final availability numbers cannot be confirmed until we get closer to the ship date. If you want to be at the top of the list to ensure you receive animals in the shipment you'll want to get your order in early. We will do our absolute best to ensure everyone gets what they order, however we are dealing with live CITES animal imports and things can happen. Refunds will be issued if we cannot supply the animals ordered at the time of the shipment. A 20% non-refundable deposit is required to hold your order. You may pay the full balance now if you prefer. The full balance will be due at the time of the CITES submittal (~30 days prior to export). If you pay with PayPal the full balance must be paid at the time of check-out. If you pay with credit card only the 20% deposit will be charged to your card unless otherwise noted in the comments section during check-out. All orders will ship after making final arrangements at the time of delivery. Orders will not ship without an agreed upon ship date and location. Shipping details will be coordinated via email, so please use a valid email address when you place your order. Shipping for hold at the nearest FedEx location may be required depending on your location and the local weather conditions. Holding at the nearest FedEx location is STRONGLY encouraged for all shipments regardless of local temps. Direct signature is required for all shipments. We anticipate that the Tesoros de Colombia Yellow ‘Black-Foot’ terribilis will be well started and 4-6 months old at the time of import. Unfortunately, we do not anticipate any sexable animals for this shipment. 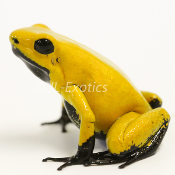 Frogs offered are captive bred, unsexed and approximately 4-6 months or older.